The 7500 represents a fresh look at Broad Ion Beam Milling. The system is designed around our new 50 cm plasma source and a new high reliability rotary substrate table. The ion source is the largest from our series of RF excited ion beam generators. By matching the attributes of the large plasma generator to a very robust accelerator the ion source delivers groundbreaking performance in terms of beam quality. The ion accelerators used in these systems are customised to achieve maximum benefit to the application. All are characterised by a robust structure and class leading beam quality delivering perveance matched beams with optimised emittance to deliver tight low divergent broad beams. They deliver the performance needed when manufacturing a nano scale world. This results in repeatable milling performance with very good within wafer non-uniformity from a very low divergence collimated ion beam. Dual plasma bridge neutralisers couple electrons to the beam plasma for effective charge neutralisation at illuminated surfaces. Interfaced to an industry standard SEMI MESC compliant wafer handling platform the system may be configured for processing various wafer sizes up to 200 mm diameter and platens up to 225 mm square. The variable angle rotary substrate table provides effective sample cooling. End point detection using secondary ion mass spectroscopy (SIMS) is optionally available for precision milling applications. 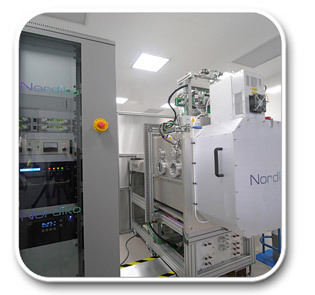 Wafer handling and process supervision is controlled by the proven Nordiko automation system.